Today, I was looking through a collection of nineteenth-century Spanish Academic drawings--which I will explore at greater length in my next post--when I decided to take a break and read today's Financial Times. In its "Collecting" section, the newspaper features the work of two "prodigious young British artists who capture the fractured experience of comtemporary life." The contrast between the two sets of artists, nineteenth-century Spanish students and young contemporary British artists, could not be greater. In her article "The P-Word," critic Jackie Wullschlager writes about the painting Strange Solutions by Katy Moran (British, 1975), saying: "Vestiges of landscape or portrait forms persist alluringly. I detected a thick, snowy avenue . . . which briefly reminded me of Monet, and a human figure is suggested in deft gestural outline at the heart of the rococo brushwork . . ."
If art is a medium of communication and the artist is the communicator, then we are either playing a very poor game of telephone with Moran or the artist hopes that, like Navajo codebreakers, critics will interpret what they mean. For her part, Wullschlager will not commit to any ideas or feelings inspired by the work; not even being sure as to whether or not the works are portraits or landscapes. Instead she says it "reminds" or "suggests" something. I could go on, but my point, unlike the artists' intent, is clear: this does not communicate, it confuses. By comparison, the skills being taught to the Spanish student who created the "Study of an Adult Male," are steeped in a tradition of clear communication. 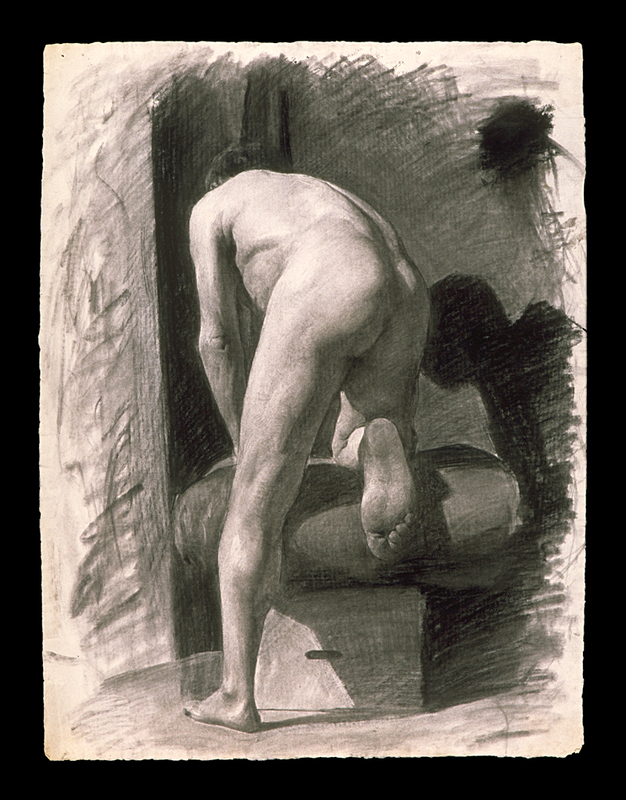 The artist is learning the vocabulary of the human figure, its structure and its range of motion. As a result, this artist will be able to place the figure in a wide array of narratives. Much has been written about nineteenth-century academic training. For the most part, Modern to Contemporary artists and art historians dismissed the Academy and its strict teaching as oppressive to creative abilities and limited in its ability to communicate. As a result, they regularly discuss the Academy as if it were Goliath and the Impressionsists were David. All who followed David's example of opposing the Academy were numbered among the Chosen People and all others were, by comparison, Philistines. But, I ask, is this evident in the fruits of either philosophy? Which generation of young artist seems more limited in its ability to communicate? As my father often says, "Art is personal." Personally, I am more stimulated and provoked to deeper thought and feeling by clear communication than by vague suggestions.